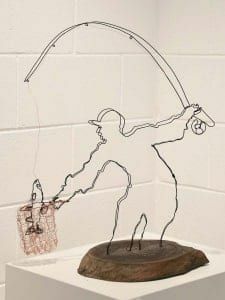 Felicity Cavanough plays with wire and loves to wander the streets of her rural hometown Mudgee, in search of great food. After abandoning her shark wrestling post almost 7 years ago from the Eastern Suburbs beaches of Sydney. Constantly lost in daydream and perpetually controlling the rabble of ideas jostling for position in her thoughts. 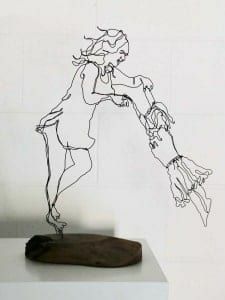 She is enthusiastically obsessed about the kinetic works of Alexander Calder, 19th century Impressionists, playing with paint and attempting to learn new languages. 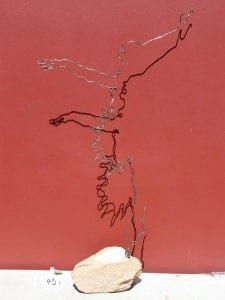 When she is not doing those things, she creates wobbly wire sculptures and teaches people of all ages to do the same. Felicity was voted amongst her Artist peers as the winner of the 2017 Just Art competition at Gauge Gallery in Sydney and won the Peoples Choice award at the York Festival hay bale challenge in Western Australia in 2017. 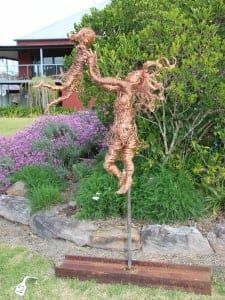 She regularly exhibits at Garden Sculpture events locally and across the nation.